My sons love to listen to audio books. We used to have a clock/radio/cd player in their room at night so they could listen to Ramona, Henry, Ralph S. Mouse, Hank Zipzer and many more. Then the cd player broke. Sometimes it was a little too loud anyway. Well, with the new Playaway Digital Audio Player, that problem is solved! And, they can each listen to what they want. Don’t confuse the Playaway Audio with the PlayAway View. The View is a handheld device with a screen that allows you to view the book while listening to the story. The Playaway Audio is a small device (the size of a credit card and about a half an inch thick) that plays audio books. No pictures. 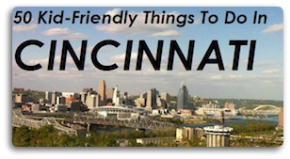 You have to supply your own AA battery and a set of earbuds. Which is fine with me, because that is a lot more sanitary. These handy little devices are great for night time listening, car trips or times when the kids need something quiet to do. The stories are told in just as an exciting manner as any audio book and the kids are enthralled. It’s such a nice, compact audio player. You do have to be careful because replacement costs are high. But, you only have once piece to keep track of—no chargers or other accessories. 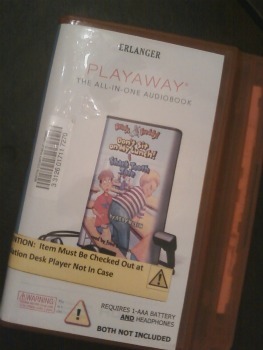 Not only does the Kenton County library have Playaway Audio devices for kids, but they have many popular titles available for adult patrons as well. Because the Playaway Audio devices are in high demand, you may want to reserve a few on line before you make a trip to the library. We were lucky and found a few titles that my son enjoyed, but there were not many on the shelf. I think my boys would love these. It would be WAY better than listening to Kidz Bop 18! We love audio books – our girls really enjoy listening to stories in the car. I need to see if our local library in Mason has these. We love the Ramona the Brave books too.